In this world it is nearly impossible to be stuck in hell. Primo Levi, the Jewish Italian chemist and Nobel-prize winning author and scientist, after living through the Holocaust in the most fearsome camps, came out with book after book of vignettes devoted to evocations of humaneness and goodness within his tormenting environment. Clarice Lispector, a heartbroken genius of a Brazilian writer, after listing many profound and tragic disappointments in her life, concludes ''I am persuaded that life is beautiful.'' Goodness is a sometimes elusive and meandering element, an unexpected surprise, a slow warm realization. Its sources are not always ''virtuous'' or kindly toward us, and yet, as we grow, we learn to see that they are cropping up all around us. Renowned novelist Jon Hassler investigates this very phenomenon as he ventures into a work he had considered impossible to write. Through what he recognizes as a ''cocoon of goodness,'' he recounts events and persons in his life, from relatives to childhood friends, teachers, priests, and characters of his own creation who have done him good, enriched his life, saved him. Like Levi, Lispector, J.F. 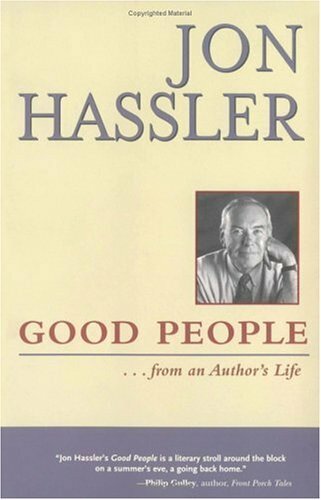 Powers, and many others, Hassler's heart-eyes have gradually been opened to the unpredictable perpetrators of goodness and the profound consequences they work in our souls. Engaging, humourous and poignant, these sketches of goodness might awaken in you countless examples of your own. Fans of Hassler and his work will no doubt delight in these sketches of the many people who accompanied him through life and warmed his heart. The varied cast of characters includes Hassler's parents, boyhood friends, relatives, colleagues, and even the fictional characters he has created in his many years as a writer. Like his other books, "Good People" will be enjoyed by people of all ages and from all walks of life.